With the acclaimed one-two punch of Sicario and Hell or High Water under his belt, screenwriter Taylor Sheridan was two-for-two in the thinking man (and woman’s) action department over the last few years. 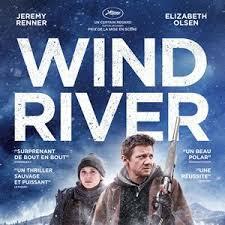 With Wind River, Sheridan—who also directed—continues his winning streak with an intelligent, edgy crime drama that delivers on high-tension suspense filmed against the haunting, gorgeously primitive backdrop of winter on a Wyoming Native-American reservation. Jeremy Renner (Kill the Messenger) plays a Fish and Wildlife tracker with a tragic past who finds the body of a young Native-American woman in the snow during his routine rounds. But since the body was found on the reservation, a federal agent (Elizabeth Olsen, Godzilla) becomes the key investigator in the case even though she is not familiar with the rugged territory. Renner and Olsen form an uneasy bond at first, but eventually collaborate to track down the culprit. Like Sicario and Hell or High Water, Sheridan is once again terrific at capturing little moments that make his characters tick, whether it’s through subtle mannerisms, wry and often poetic dialogue, or quirky behavior. Strong performances by Renner and Olsen, who at first seems miscast but eventually scores in the role, are excellent, offbeat leads, and there’s terrific support from American Indian thespians Graham Greene (Dances with Wolves) as the local sheriff and the Gil Birmingham (Jeff Bridges’ detective partner in Hell or High Water) as the troubled father of the dead girl. While the film didn’t deliver the box-office numbers of its Sheridan-penned predecessors, it did score good reviews and extended runs in arthouses. Look for this intense, moody film expand its audience in ancillary markets.